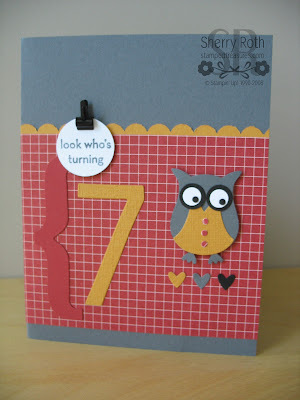 Sherry"s Stamped Treasures: Happy Birthday Eathan! Today is my sons 7th birthday. I can't believe my baby is 7:( Time goes by much too quickly. It was actually while I was on maternity leave with him that I was introduced to Stampin' Up! Amazing how time flies! On to the card... This card is CASE'd (Copy And Share Everything) from the card on page 184 of the Idea Book & Catalogue. That's one of the things I LOVE about our catalogues - they are full of so many inspiring ideas that you can either use as a starting point or copy exactly. I did make some modifications because I didn't want it to say hi so I replaced that with the #7 and I really wanted to incorporate the owl punch (LOVE IT) so I changed that up a bit. But the layout is pretty much the same. The next thing to decide was the colours I wanted to use. Eathan's favourite colour is red so I knew that I wanted to incorporate it. So I checked which dsp I had that had some red in it but wasn't too feminine. The piece that I chose is from the Love Letter paper pack and is Riding Hood Red. 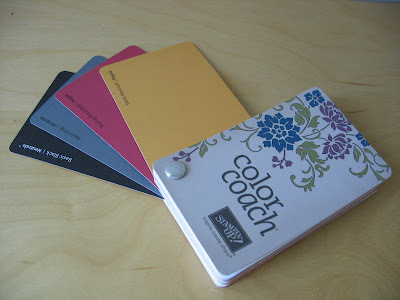 So then I went to my colour coach and looked at the colour combinations listed on that card. Riding Hood Red, Basic Gray and More Mustard with a splash of black are the colours I decided on. Another colour combination that I never would have used if it wasn't for the amazing colour coach! Using the catalogue made this card so quick and easy. Sometimes coming up with a card layout is the hardest thing about making a card. The Idea Book & Catalogue can turn that into the easy part of the process. Start marking the pages that have projects that you are drawn to. Use it to make notes about particular projects, including things like what you like about a project or noting the unique way they used a particular accent. It is really the best resource you could have. Plus - did you know there is a list of supplies if you are ever wondering what was used on a particular project. You can check it out here. If you are in Canada and don't already have a copy of the Idea Book & Catalogue, let me know. I'd be happy to send one to you for the cost of shipping. Cardstock: Basic Gray (121044); Whisper White (100730); More Mustard textured (119931); Riding Hood Red (111348); Basic Black (121045); Love Letter dsp (117162). Accessories: Big Shot die cut machine (113439); Alphabet Simple Numbers die (115968); Hearts & Brackets die (115955); Mini Library Clip (109857). Inks: Basic Gray Stampin' Write marker (120966).